Once the construction of you business premise is complete, the attention often turns to your yard or compound. Landscaping is important for many reasons than simply having a lovely yard: A well-landscaped compound of a new commercial premise is a beautiful sight. Not only does it allow one to feel more comfortable, but also generate positive compliments from clients coming in. Michiana Commercial Landscaping are experts in landscaping construction and have been in business for a long time. Landscaping adds significant value to the structure – increasing its marketability. Estimates range from 10-12% increases in its value following professional landscaping. A poorly landscaped compound can drop the expected sale price significantly. Landscaping has a way of managing natural elements like rain, by absorbing or directing the flow of rainwater - thereby preventing floods or overflows. 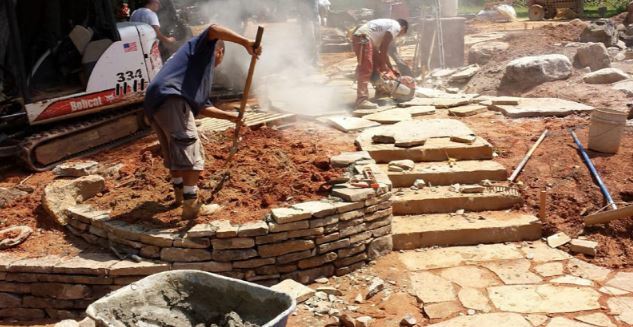 From the landscape construction reviews of this company given by clients who have sought their services, it is evident that they are a reputable and reliable company. Landscaping improves the energy-efficiency of the business premise – making the compound generally feel cool during hot weather. Landscape construction allows for easier navigation through the compound by providing paths and walkways. This ensures gardening elements like flowers and protected grass are not tampered with. It enhances outdoor living space by adding life to it. A gazebo or a patio in a well-landscaped compound adds quality to the outdoor living. Michiana Commercial Landscaping will carry out large commercial and private estate projects with the highest quality materials, providing the best landscape design and construction services. With a wide range of services that suit your every need and requirement, our team has the know-how and expertise to get done what you need done. If you do not have an idea of what you want in mind, no worries. The staff are proficient in what they do and will offer suggestions free of charge and give ideas that will exceed your expectations after ground work is done. Landscaping construction will involve adding and subtracting. A team of professionals will work hand in hand with the commercial premise owner to know if they want a few things removed too. How about a new walkway? Or a patio? A perimeter wall? Landscaping bit by bit without a plan is among the greatest mistake that a commercial premise owner can make. This brings about disorganization and misuse of equipment, material and finances. Expert advice is more important than you think. It saves you greatly. A good design will result in a good looking property. Services in landscaping need attention to detail and factoring different issues like the terrain, the initial house construction, the weather and others. It will be heartbreaking to spend too much and get substandard services from people purporting to be experts in landscape construction. As you look around for one, ask for recommendations and reviews from friends, colleagues and family. Michiana Commercial Landscaping is a well-known company and you will be amazed at what the company can do. It transforms your outdoor space into a haven of beauty and the aesthetics are out of this world.